natural unemployment rate | Utopia – you are standing in it! I do admire the way in which the USA has been able to have a steadily falling equilibrium unemployment rate since 1984 through thick and thin. The Great Recession had no impact on the US equilibrium unemployment rate. Not only has the largest member been able to do this, the OECD host country (red squares) has had a pretty steady natural unemployment rate too all things considered. This entry was posted in business cycles, economic growth, economic history, global financial crisis (GFC), great recession, labour economics, labour supply, unemployment and tagged British economy, Canada, equilibrium unemployment rate, France, Germany, natural unemployment rate on June 2, 2016 by Jim Rose. This entry was posted in currency unions, economic growth, Euro crisis, job search and matching, labour economics, labour supply, macroeconomics, poverty and inequality, unemployment, welfare reform and tagged employment law, equilibrium unemployment rate, Eurosclerosis, labour market regulation, natural unemployment rate, social insurance, unemployment duration, unemployment insurance on September 10, 2015 by Jim Rose. 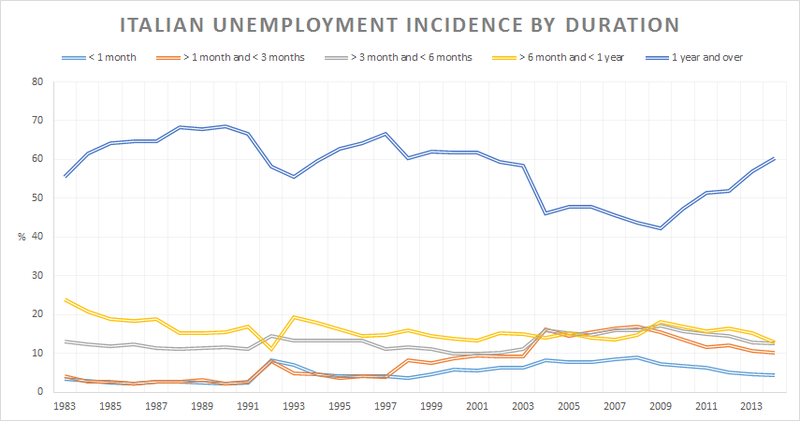 The boom that preceded the bust in the Greek economy did nothing for the rate of long-term unemployment among Greeks. 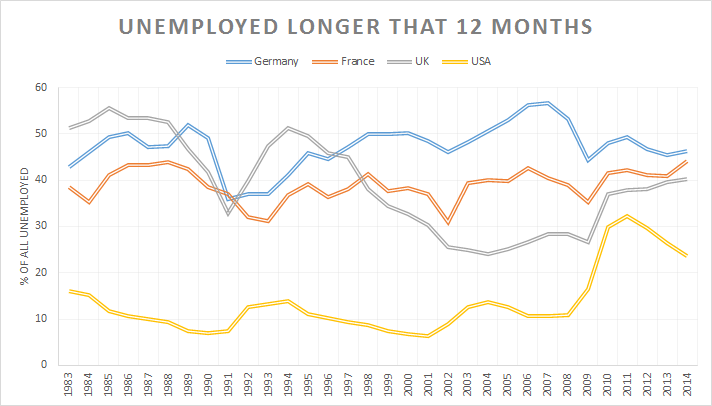 Long-term unemployment had been pretty stable prior to the economic boom after joining the euro currency union. 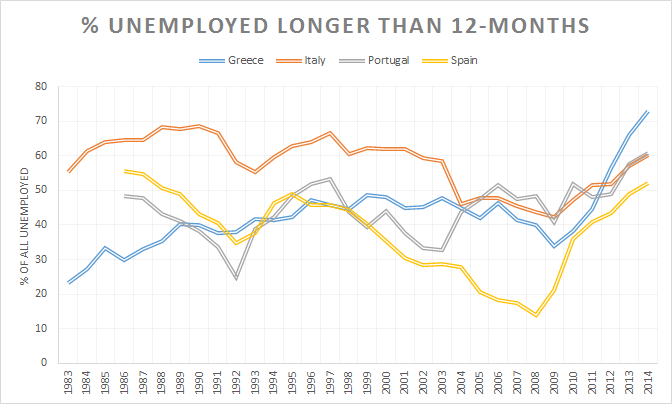 Nothing much happened to long-term unemployment in Italy or Portugal in recent decades. Spanish long-term unemployment fell in line with the economic boom in Spain over the 1980s and 1990s up until the global financial crisis. This entry was posted in business cycles, currency unions, economic growth, economic history, Euro crisis, job search and matching, labour economics, labour supply, macroeconomics, occupational choice, unemployment, unions, welfare reform and tagged employment law, equilibrium unemployment, Greece, Italy, labour market regulation, natural unemployment rate, Portugal, Spain, unemployment duration on August 17, 2015 by Jim Rose. As I recall, most unemployed have been unemployed longer than 12 months in Sweden have to go on a labour market program. When they returned to unemployment after the program, the clock starts again. They are deemed to be freshly unemployed rather than adding to the previous spell with an interlude on a make work program. 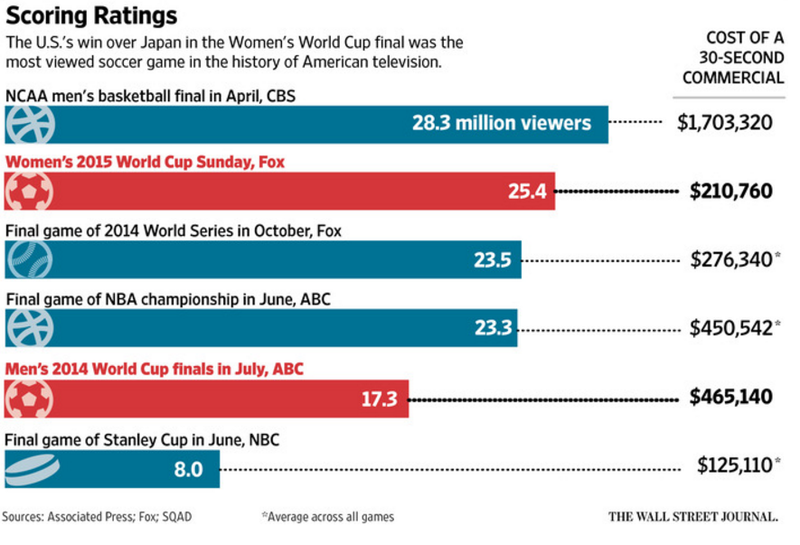 This makes Swedish long-term unemployment data rather unintelligible. 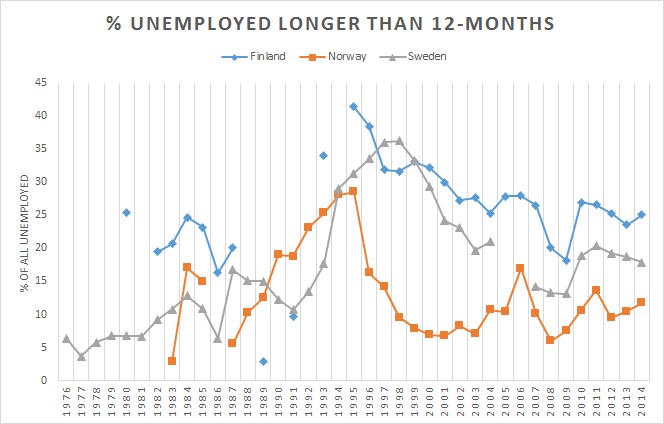 Finland was recovering from its worst depression since the 1930s and the early 1990s when its data on long-term unemployment started to be continuous. This makes Finnish unemployment data rather difficult to interpret. Norway’s data for the long-term unemployed goes up and down a bit too much to be trustworthy without a background policy narrative. This entry was posted in applied welfare economics, business cycles, constitutional political economy, economic history, job search and matching, labour economics, labour supply, macroeconomics, Public Choice, unemployment and tagged borders, deployment subsidies, economics of borders, equilibrium unemployment rate, Finland, labour market programs, long-term unemployment, maps, natural unemployment rate, Norway, Scandinavia, search and matching, Sweden, unemployment durations on August 16, 2015 by Jim Rose. 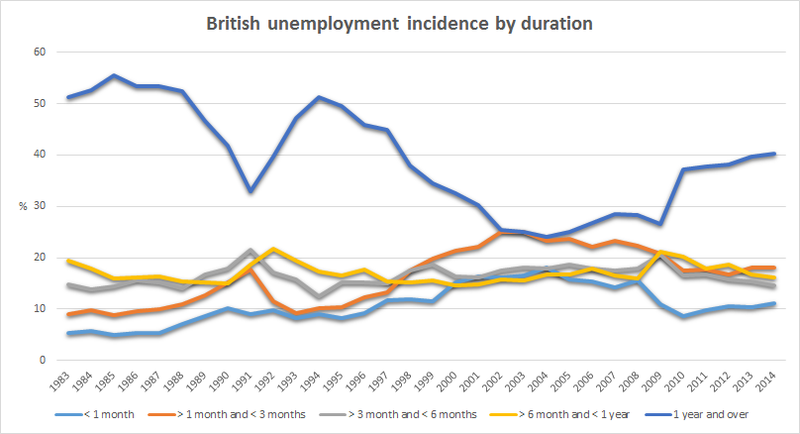 As the British labour market and long-term unemployment was starting to get something like that in the USA, the USA started to have unemployment it was more like the European labour markets in terms of the number of long-term unemployed. Nothing much happened in Germany and France. 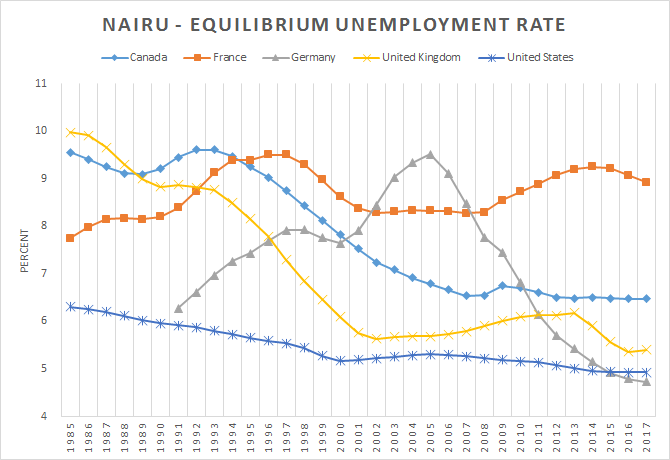 This entry was posted in currency unions, Euro crisis, job search and matching, labour economics, labour supply, macroeconomics, unemployment and tagged British economy, equilibrium unemployment rate, France, Germany, long-term unemployment, natural unemployment rate, social insurance, unemployment duration, unemployment insurance, welfare state on August 14, 2015 by Jim Rose. Unemployment of more than a year was slowly tapering down in Italy before the global financial crisis, but ever so slowly. This entry was posted in business cycles, economic history, Euro crisis, job search and matching, labour economics, macroeconomics, unemployment and tagged employment law, equilibrium unemployment rate, Eurosclerosis, Italy, labour market regulation, natural unemployment rate, unemployment duration on August 12, 2015 by Jim Rose. 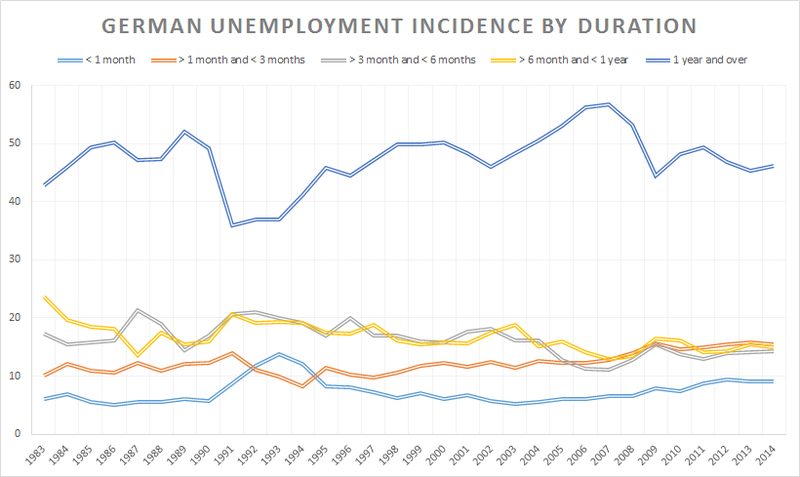 German long term unemployment has been pretty stable albeit with an up-and-down after German unification. There is also a fall in long-term unemployment after some labour market reforms around 2005. This entry was posted in economic history, Euro crisis, fiscal policy, job search and matching, labour economics, labour supply, macroeconomics, unemployment, welfare reform and tagged equilibrium unemployment rate, Eurosclerosis, German unification, Germany, natural unemployment rate, poverty traps, unemployment duration, unemployment insurance, welfare state on August 11, 2015 by Jim Rose. 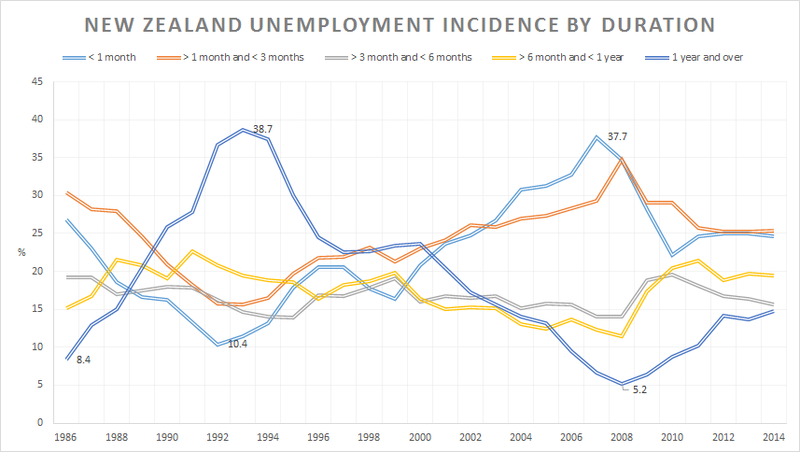 There has been bit of a wild ride in long-term unemployment in New Zealand. Long-term unemployment – longer than one year – ranging from just over 8% of unemployment in 1986 to nearly 40% in 1992 then down to 5% in 2008. Clearly the duration of unemployment in New Zealand is highly sensitive to the business cycle unlike the case in the USA or UK. 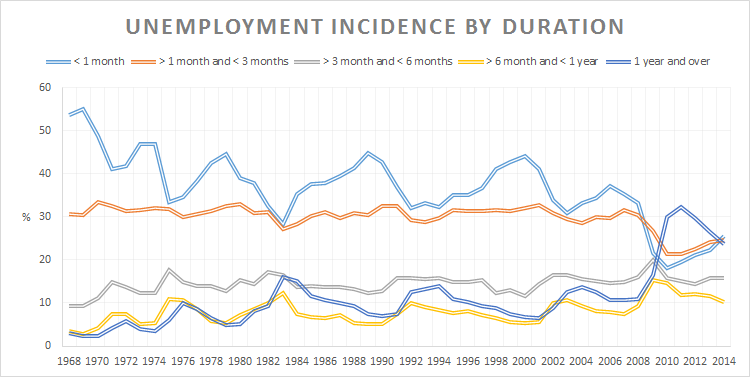 This sensitivity of long-term unemployment to the business cycle does not bode well for the hypothesis of hysteresis where human capital depreciates the longer a jobseeker is out of employment. For this hypothesis to hold, there must be some enduring aspect of long-term unemployment rather than just going up and down with the business cycle rather noticeably. The rival hypothesis to hysteresis is the long-term unemployed tend to be those who have a lot of trouble getting employment, which is why they end up been unemployed for a long time. Again in New Zealand, these less employable jobseekers appear to be able to find jobs quite easily when the labour market is good. This entry was posted in business cycles, human capital, job search and matching, labour economics, labour supply, macroeconomics, politics - New Zealand, unemployment and tagged equilibrium unemployment rate, hysteresis, long-term unemployment, natural unemployment rate, unemployment duration, unemployment rates on August 10, 2015 by Jim Rose. This entry was posted in business cycles, economic history, global financial crisis (GFC), job search and matching, labour economics, labour supply, macroeconomics, unemployment and tagged British disease, British economy, equilibrium unemployment rate, Margaret Thatcher, natural unemployment rate, unemployment duration, unemployment rates on August 9, 2015 by Jim Rose. The Great Recession was the first recession in the USA in a good 40 to 50 years where the composition of employment changed by much. Even the big recession at the beginning of the 1980s did not do much to the composition of unemployment by duration in the USA. Those unemployed for more than a year moved from barely double digits even in a bad recession prior to 2008 to coming on one-third of all unemployed. Likewise, those unemployed for less than a month halved from 40% to 20%. Something changed in the US labour market with the Great Recession and the long extensions of unemployment insurance from 26 weeks to 52 weeks and then 99 weeks. 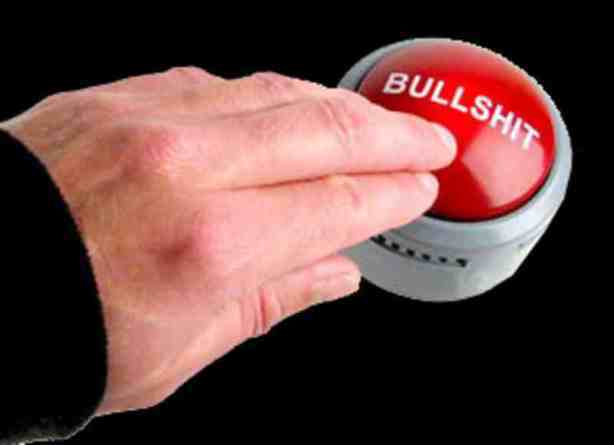 This entry was posted in budget deficits, great recession, job search and matching, labour economics, labour supply, macroeconomics, politics - USA, unemployment, welfare reform and tagged natural unemployment rate, taxation and labour supply, unemployment duration, unemployment insurance, unemployment rates, welfare state on August 8, 2015 by Jim Rose. This entry was posted in Euro crisis, job search and matching, labour economics, macroeconomics, minimum wage, unemployment and tagged employment law, equilibrium unemployment rates, Eurosclerosis, expressive voting, labour market regulation, natural unemployment rate, offsetting behaviour, rational irrationality, unintended consequences on August 8, 2015 by Jim Rose. As with New Zealand, Australian long-term unemployment seems to go up and down quite a lot with recessions such as those in the early 1980s and early 1990s but not after the global financial crisis. 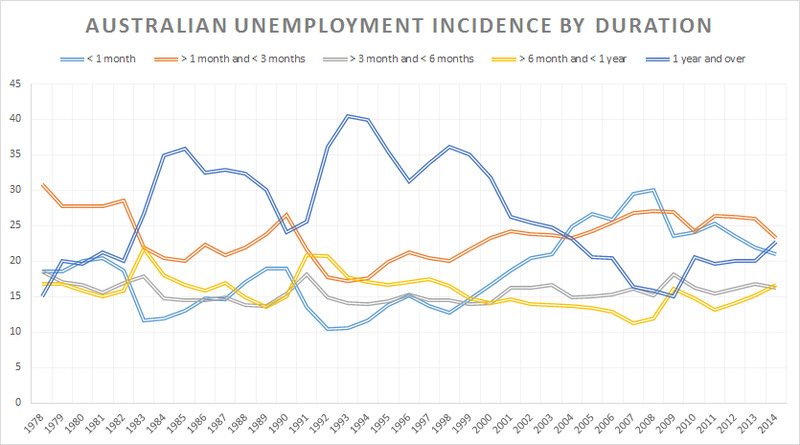 This entry was posted in economic history, global financial crisis (GFC), job search and matching, labour economics, labour supply, macroeconomics, politics - New Zealand, unemployment and tagged Australia, equilibrium unemployment rate, natural unemployment rate, unemployment duration on August 7, 2015 by Jim Rose.